I'm not really justified in calling myself a former Carthusian. I was only ever a Postulant, the stage prior to the Noviciate, and that only for two weeks, though I had undertaken the 6-week long retreat in cell, which is the method used to determine whether the applicant is likely to be psychologically suited to this rather austere life. I'm convinced I was suited, and my failure to persist was not in any way the sandard one of finding the life too hard (though maybe if I'd stayed longer this sort of difficulty would have surfaced), but for doctrinal reasons. In fact, it was a great grief to me at the time to have to leave, from the aspect of the form of life, though there have been many subsequent consolations. By way of excuse, I can say that the "Carthusian Experience" was very significant for me - indeed a life-changing one - and I did have to make a few sacrifices (for example giving up my job, flat and book collection) to make the trial. It was not undertaken lightly, and failing to persist (especially so quickly, having made such a song and dance about the whole thing - I'd been "searching" for a year beforehand) was somewhat embarrassing. Also, the life is so unusual that the experience, even if brief, if worth recording. But more of all this in another place (there are jumping off points further down this page). The photo above is of the monastic buildings of St. Hugh's Charterhouse, near Cowfold in Sussex, otherwise known as Parkminster. 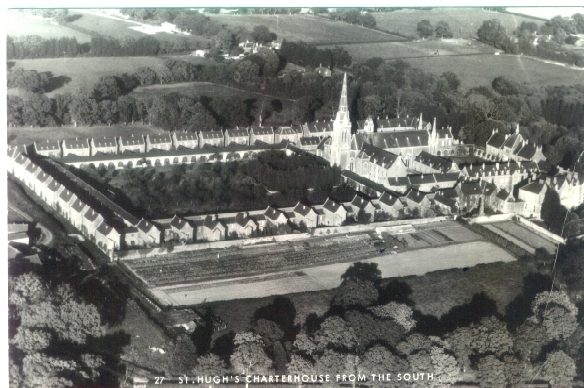 The photo is really a postcard, but was sent to me in an envelope postmarked 18th April 1978 by Fr. Bernard O'Donovan, the Novice Master, along with his first letter below. Firstly, Parkminster now has its own website (Parkminster), complete with audio-visuals. I cannot but think that, like the Carthusian order itself, the site is a strange combination of Christian wholesomeness larded with some Roman Catholic excess. I also think the website betrays too much of an accommodation to the modern world, though I understand that some of the austerity at the time I was there may since have been relaxed. Even so, how can you advertise without distortion a life that is essentially unchanged since the 11th century with such a flashy website? Secondly, here's a Sunday Times article and scary photo from 1981, briefly describing the then situation at Parkminster. Unsurprisingly not much had changed from when I was there a couple of years earlier. Thirdly, for some more fascinating information on Carthusians, follow this http://www.statcrux.co.uk: Memories of the Carthusians. Note that this website is the responsibility of another former Carthusian, not me. Interestingly, the website contains a little note from Fr. Bernard O'Donovan, the then Prior of Parkminster (he was the Novice Master in my day). This website is much more spiritual than anything I have to say at the moment. Finally, there are two books that contain mostly second-hand information about Parkminster, though based on interviews with those having first-hand knowledge. From my first-hand perspective, they seem remarkably accurate. The first book1 is "North (Richard) - Fools for God" – follow this link2 for my extract of the relevant chapters. The second book (much more extensive as regards Parkminster) is "Maguire (Nancy) - An Infinity of Little Hours: Five Young Men and Their Trial of Faith in the Western World's Most Austere Monastic Order", obtainable from Amazon (Amazon: Nancy Maguire - An Infinity of Little Hours, Nancy Maguire is the wife of a former Novice). I have very fond memories of Fr. Bernard, and quite an extensive correspondence with him - extensive, that is, for interaction with the Prior of one of the most reclusive of Orders. This splits into two parts: letters while I was contemplating a Cartusian vocation, and then a series of somewhat disputatious letters after I left Parkminster following an evangelical conversion. I have been writing up my Carthusian experiences, and have now completed most of the first draft. For the account of my trial in cell, follow this link3, which has on-going links to other reminiscences. The account of my rather brief Postulancy, during which my evangelical conversion occurred, is still missing, though is alluded to in the following link4. 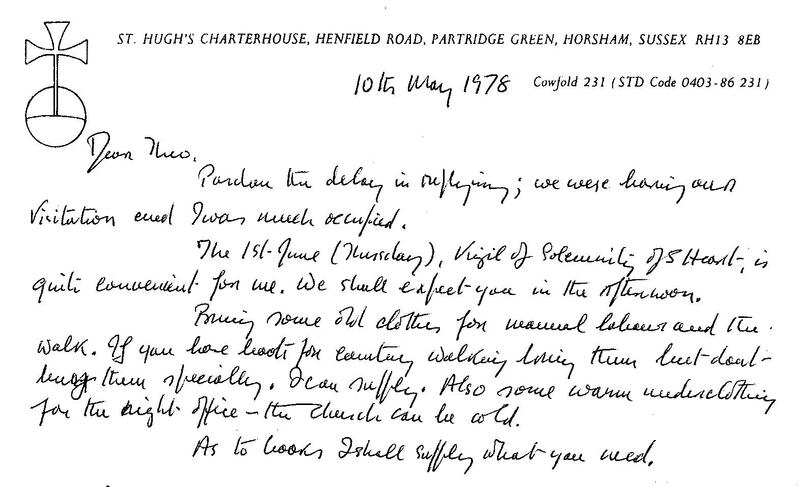 The early correspondence with Father Bernard appears below. For the later “post-Parkminster” correspondence, follow this link5. Below is a letter from Fr. Bernard O'Donovan, the then Novice Master (and later Prior) following my request to make a trial of the Carthusian life. This followed on from my few days in the Guest House, during which time I had had various discussions with Fr. Bernard. The letter is very warm and welcoming, and displays Fr. Bernard's enthusiasm for the contemplative life. The letter hasn't reproduced very well, so apologies if you can't read it. Here's a transcription8, with a few explanatory footnotes. The "trial in cell" refers to a six-week retreat in one of the hermitages. Below is another letter from Fr. Bernard. The letter has reproduced a little better than the one above, but here's a transcription9 in any case. Guy Thackrah Parkminster - Guest House Why did I become a Christian? Website - Progress to Date, 2 Why did I become a Christian?